Downtown Lisbon, known as the Baixa, is often likened to the beating heart of the city. 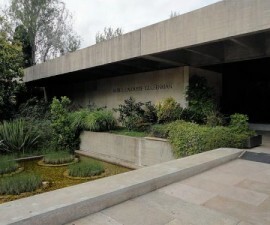 It stretches from the riverfront on the banks of the river Tagus to the Avenida da Liberdade. Much of downtown Lisbon was destroyed by the great earthquake of 1755, which was the main cause for making disappear huge swathes of the Lisbon skyline. When it was rebuilt, it was done so at the cutting edge of urban planning and design, making it the first example of town planning in Europe. Broad squares and pedestrianized streets are flanked by uniform, neoclassical buildings that lend the district an air of grandeur. The Baixa is currently under consideration by UNESCO for designation as a World Heritage Site and much work is being undertaken to renovate it by restoring the delightful Art Deco tiled shop fronts and elaborately decorated bars, shops and cafes. 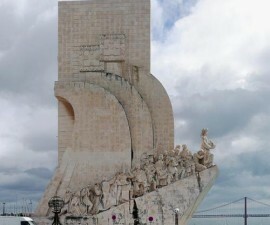 Downtown Lisbon is considered to be the city’s primary business district, but this does not take away from its welcoming atmosphere and cultural relevance. Indeed, the headquartering here of many of Portugal’s leading banks lends the area an air of sophistication that makes it a pleasure to wander through its wide pedestrianised streets, relax on its leafy squares, explore its unique boutiques and enjoy the impromptu displays by the talented street entertainers. The simple grid system of the Baixa makes it easy for first-time visitors to navigate their way around the area. There is a feeling that wherever you are in Lisbon, all roads ultimately lead to the Baixa. 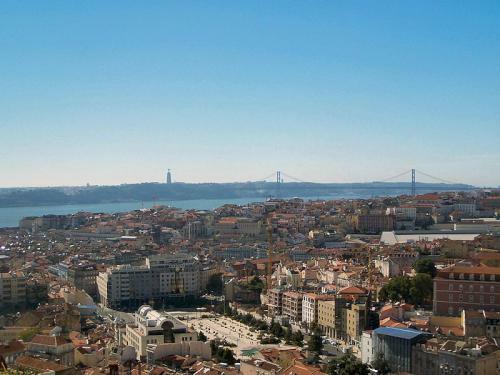 Geographically of course, the Baixa is very much a gateway to Lisbon. It is passed through en route to just about anywhere and forms a vital link between the waters of the Tagus River and the many neighbourhoods that rise away from its banks. 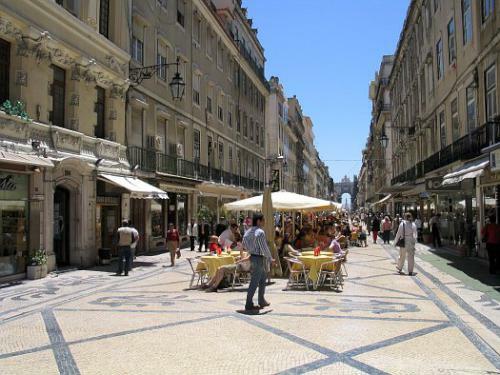 Baixa is the perfect place for indulging in a little shopping to remind you of your stay in Lisbon, Portugal. The area houses an eclectic mix of boutiques and specialist shops. Whether you are in search of one-off designer fashion pieces of major high-street names, you are sure to find it here. And if clothes aren’t your thing, there is no shortage of jewellery, gifts, artworks, flowers or traditional artisan pieces to indulge your tastes. 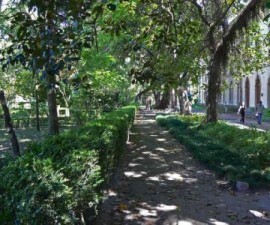 If you feel like pushing the boat out, head for the Rua da Prata (Street of Silver) or the Rua Aurea (former the Rua do Oro, or Street of Gold). Here you will find the city’s leading silversmiths and goldsmiths practising their age-old craft and selling their wares at highly competitive prices when compared to similar items in the UK. Gold in particular is noticeably cheaper in Portugal and is of exceptional quality, so it is well worth keeping your eye open for something special. 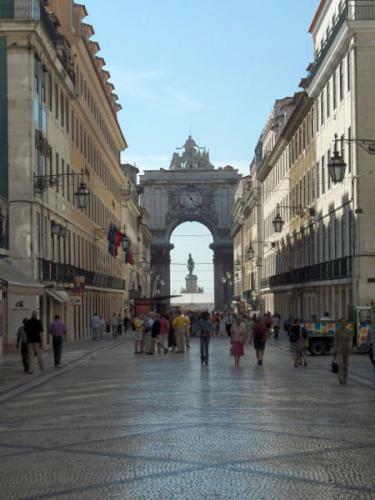 Take a walk down the Rua Augusta from the Triumphal Arch that heralds the opening to the Baixa, and follow your path as far as the Comercio Square to experience the charm of this delightful Lisbon district. Finish up in Rossio Square, in front of the huge National Theatre and St George’s Castle. This is the perfect spot from which to take it all in, relaxing over a cool beer, a glass of Port wine, a delicious coffee or a simple but delicious custard cream tart, one of Portugal’s most delicious traditions.